I saw this tip on pinterest for switching scents in a melted-wax “Scentsy” warmer. 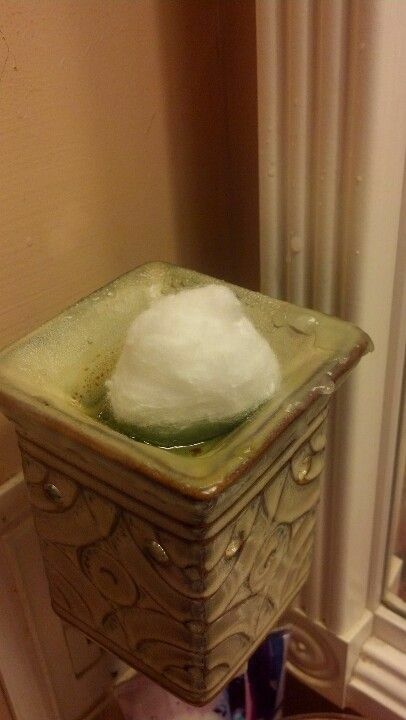 Place a cotton ball in your melted wax and watch it absorb before your eyes, after it’s absorbed throw it away. Easy way to switch scents. Normally, what I do is switch off the warmer so that the wax hardens, and then gouge it out with the back of a (no-eraser) pencil. But I thought this cotton-ball tip was worth a try. First of all, one cotton ball wasn’t enough. And then the challenge was to get the cotton balls unstuck from my fingers and into the trash. My fingertips still feel a little gucky. Still, though, I guess this tip would work well enough if you didn’t want to wait for the wax to harden. Probably it would be best with a GIANT cotton ball. Next Next post: We have reached 100 days!